We make way too much garbage! All that garbage started as things that were made, grown, or harvested from the Earth for us to buy, eat or use. 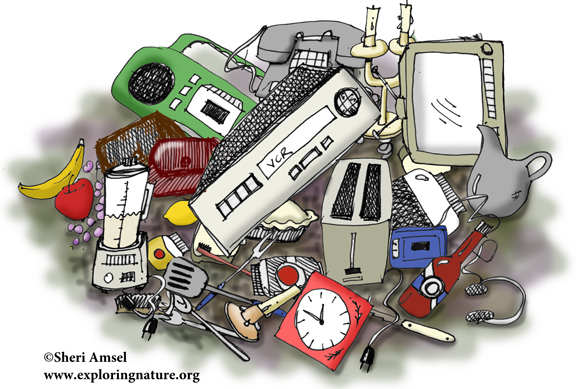 The trouble is, the amount of things we buy and dispose of is becoming a problem. We are running out of resources to make all the things we need and running out of space to throw out all that garbage. Researchers have found that Americans each make about 4.5 pounds of garbage every day. The United States makes more garbage than any other country on the planet. We have 5% of the people on Earth, but make almost 1/3 of all the world’s garbage! So as landfills keep filling up, people will have to find more places for all that trash. Too much trash has always been a problem for communities of people. Even earlier in history -- in the years 1347-1351 the bubonic plague, also called the “black death,” spread through Europe, Asia and Africa killing 75 million people. What they didn’t know at the time was that it was all caused by too much garbage in the streets! Piles of garbage attracted rats, which had fleas, which carried the disease. The rats carried it from place to place. The lack of sanitation made the spread of the epidemic the worst in human history. At the end, half the population in the places struck, were dead -- all because of too much trash! Many early landfills were made in wetlands, which were thought to be wasteland back then. Early landfills leaked into rivers and lakes and built up gases, like methane. Garbage dumps used to catch fire and even explode, because as garbage rots, it gives off methane, a flammable gas. The first garbage burning plant, called an “incinerator,” in the United States was built on Governor's Island in NY in 1885. By 1914, there were 300 incinerators burning garbage in the U.S. Landfills have changed over time. As of 1995, there were more than 2,500 landfills in the United States. In 1993, a law was passed that all landfills must be lined with a big plastic liner to keep them from leaking into the environment. They also have to have “gas monitors” to keep track of the dangerous gases that build up. Many landfills have been buried, landscaped and reclaimed into golf courses or city parks all over America. Methane gas adds to the greenhouse effect in the atmosphere, but can also be collected and burned for energy. It is now fueling some passenger trains and buses in Sweden. Called “biogas” this new form of energy uses waste, like animal parts left over at the butcher, to make the methane. It is considered a green energy source. Methane is made by mixing a big organic soup, with all the old cow parts and manure, and then adding bacteria that will digest the mixture. The bacteria, as it digests, gives off the gas. The energy company collects the methane and sells it as fuel. Each cow provides 2.5 miles of train travel. The good news is that we can make changes that will help both using up our resources and filling up our landfills. You can keep a list of the things you do to help out and add to it over time. For small household things, make recycling boxes for paper, magazines, newspaper, cardboard, cans, and bottles. The Environmental Protection Agency (EPA) reported in 2005 that Americans who recycled and composted, stopped 64 million tons of stuff from going to landfills or being burned. That equals 174 billion pounds of trash in one year alone! Help out by returning bottles that have deposits for your parents. That takes time. If you don’t have time, bag them all up and bring them to the local Boy Scout or school bottle drive bins. Buy Recycled Products. Recycling works in a loop, but only if all parts of the loop are going. The first part of the loop is when people, like you, recycle. The next part is when the recycled things get collected, cleaned and sold to factories that can re-use them. Then the recyclables are made into new products like newspapers, carpets and plastic tubs. Then people, like you, buy them again. That is the recycling loop. Whenever you buy a recycled product you are helping close the recycling loop. Keep adding to your list over time. Recycling and saving gets addictive! Recycle and buy recycled products. Send e-cards instead of paper cards. Use Tupperware instead of plastic bags. Use a lunch box instead of paper or plastic sacks. Buy a water bottle and carry it with you, so you can stop buying bottled water. Give water bottles as gifts, so everyone can stop buying bottled water! 2. How was bubonic plague, caused by too much trash? 3. Name three reasons why dumping trash into wetlands was so bad? 4. What did we do to stop landfills from leaking into our waterways? 5. How have some countries made good use of the methane gas that builds up in landfills?